1. Connect your PDA to your computer using your Cradle or Sync Cable. 2. 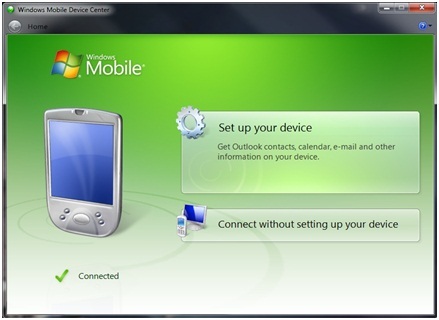 Depending on what operating system your computer uses (Windows XP, Windows Vista/Windows 7 or Windows 8) you want to make sure your Activesync or Windows Mobile Device Center says Connected. 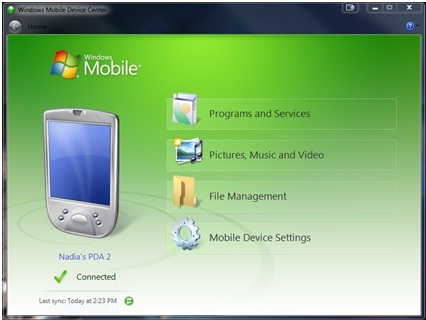 Figure 1.1 is an example of a successfully connected PDA to a computer using Windows Mobile Device Center. Note: You can check what operating system you are running by right clicking on the My Computer icon and going to Properties. 3.If your PDA says connected but you have the option to Set Up Your Device or Connect Your Device Without Setting Up. Go ahead and click Connect Your Device Without Setting Up. Figure 1.2 is an example of a device that is not fully partnered with a computer. It may say connected but the actual sync connection has not been established and therefore the internet will not be shared between your PC and PDA. 4. 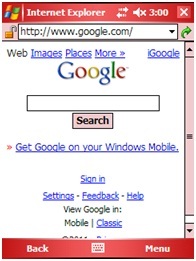 To test if your PDA has successfully connected to the internet, you can click Start>Internet Explorer and browse to a webpage like https://www.google.com. It is important that you are connected to the internet to update your neatopricer. Figure 1.3 shows how to browse to Internet Explorer on your PDA. Figure 1.4 shows a PDA successfully connected to the internet. 5. Once you have determined you are successfully connected, we can start getting the framework installed. First, you must uninstall the old framework. Go to "Start>Settings>System" and then Remove Programs. You are going to remove Microsoft .NET Framework 2.0 and then Restart your PDA by pushing the Soft Reset button on the bottom or back of your PDA. On the Dell's its located on the back, its a very small pin size hole. On the Socket PDA's is it located on the bottom and it too, is a small sized hole, you must use your stylus on both PDA's to reset the device with that hole. 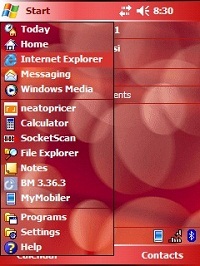 Once the PDA is back up and connected once again to Windows Mobile Device Center or Active Sync, hit "Start>Internet Explorer" and please browse to: db.neatoscan.com on your PDA using Internet Explorer as shown in figure 1.5. 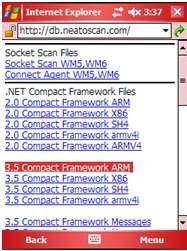 Once you are at db.neatoscan.com you want to click on the 3.5 Compact Framework ARM link. Figure 1.6 shows the link you need to click first. Please Note: If you are running, Windows Mobile 2003, Pocket PC 2003 or Windows Mobile 2003 SE you must install a different .NET. On db.neatoscan.com there is a dedicated section titled "Windows Mobile PPC/2003 CE Installation Files" with the Socket Scan Files and framework that you need. The framework is listed under this section 3.5 Compact Framework CAB. 6. Once you have successfully installed the 3.5 Compact Framework ARM Link you will be prompted to restart your device. Go ahead and click the ‘Restart’ button at the bottom left corner when prompted. 7. 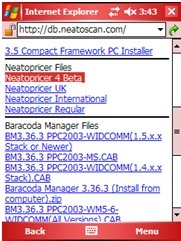 After your device is back up and running, browse back to db.neatoscan.com and scroll down till you see “Neatopricer 4 Beta” as shown in figure 1.7. Once you click the neatopricer download and let it install you are now upgraded to the new version of neatopricer. 8. After it is successfully, installed you will be prompted to register your device. You can register your device by clicking File>Register and entering your username and password associated with your neatoscan.com account. 9. After you have successfully registered your device, you can proceed to download your database. You can do this by clicking the Account tab in Neatopricer and hitting the start button shown below in figure 1.8. 10. Congratulations! You have successfully upgraded your neatopricer to the latest version. 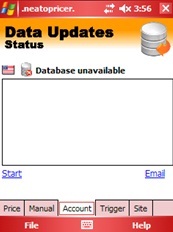 Please wait for your database to finish downloading before unplugging your device. Once you have installed the new version, click here for the new Trigger setup instructions.